The Chat tool can be used for real-time conversation with course users. Any user in the course can participate in a chat conversation. All content in a course chat can be viewed by anyone in the course. 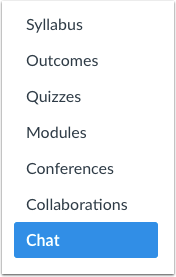 Currently there is no load limit for a course chat, but larger numbers of course users may affect performance. A user must be actively viewing the chat tool to appear in the chat list. You can open Chat in a new browser window while viewing other areas in Canvas. If you cannot view the Chat tool, Chat has not been enabled for your institution. You cannot delete chat messages. In Course Navigation, click the Chat link. When you open the Chat page, you immediately join the chat. Chat discussion appears in the content window . To receive alerts for new chat messages, click the New message alerts button . If this option is turned on, you will receive alerts if Chat is open in Canvas but your browser window is minimized or you are viewing another browser tab. Alerts will not send if you leave Chat to view another area in Canvas. Chat displays the number of users who are in the chat . To view a list of these users , hover your cursor over the number. When a user sends multiple chat messages without another user sending a message, all messages will appear under the first message's time stamp. To view additional time stamps, hover your cursor over the message. To send a chat message, enter your message in the chat window . To add an emoji to your message, click the Emoji icon . Then click the Send button . Message history each course is included in the chat. Chat history can be accessed indefinitely by loading more results and scrolling through previous course chats. You can also access Chat history with the Load more results button. This button is hidden by default and can be viewed by simultaneously pressing the Shift and Tab keys (Option and Tab in Safari) on your keyboard until the button appears and is selected. Previous Topic:How do I sign up for a Scheduler appointment in the Calendar? 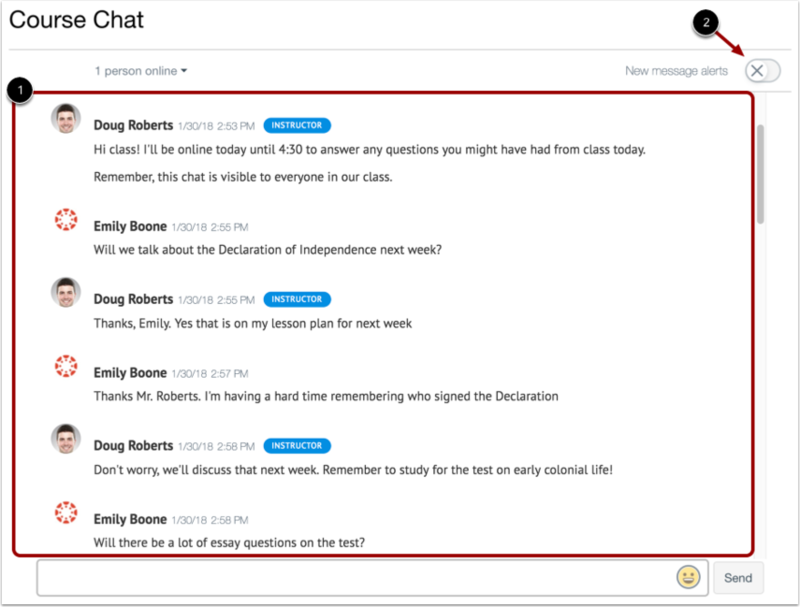 Next Topic:How do I use inline chat as a student? Table of Contents > Chat > How do I use Chat as a student?